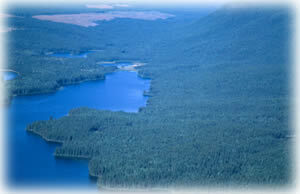 A picturesque large lake, connected with trail network to smaller lakes, in an area noted for fishing, hiking, and nature appreciation in a wilderness setting. Note that there are no camping or day-use facilities provided, and there are private resorts and cabins on Taweel Lake (at the east end of the lake, outside the park). Special Features: This park protects a representative area of the provincially-significant Sub-boreal Spruce forests in the region. Visitors must be self-sufficient and prepared for a wilderness environment. There is no vehicle access into the park. Note that access to the resorts at the east end of the lake requires a high-clearance 4-wheel-drive vehicle. The resorts at the east end of the lake can be reached by travelling about 25 km along the Lemieux Creek Valley road from Little Fort (the last part of the road is very rough). Prior arrangements must be made by anyone wishing to avail of any of the services provided by the resorts. A logging road off of highway 24 leads to the southwestern park boundary but there is no access (road or trail) from this road to the lake. The closest communities to the park are Little Fort and Clearwater. History: The park was established on April 30, 1996. Cultural Heritage: The probable route of an historic trail from Canim Lake to North Thompson Valley lies in the park, with possible First Nation use. Conservation: This park protects a representative sub-boreal spruce forest, with some old-growth, and riparian areas at the north end of Taweel Lake. The area has important habitat for fisher, wild native rainbow trout, moose, marten, timber wolf and birds such as the Common Loon, Barrow’s Goldeneye and the Three-toed Woodpecker. The Approved Management Direction Statement [PDF] for Taweel Provincial Park is available online in pdf format. Canoeing and kayaking are possible. No facilities are provided. Hosreback riding is allowed. Please stay on designated trails.